Tailgating before a Jimmy Buffett concert is always a surreal experience. Now reveling "Parrotheads" can look forward to a new kind of fun as the Peavey-designed Margaritaville SharKart invades tour stops, offering concertgoers a chance play a multimedia videogame and compete for stadium glory. On the SharKart, Parrotheads can express their inner rock stars on virtual guitars and vocals through videogame versions of classic hits Margaritaville, Volcano and Cheeseburger In Paradise. Winners from each concert will be shown on the video screens during the concert that night. 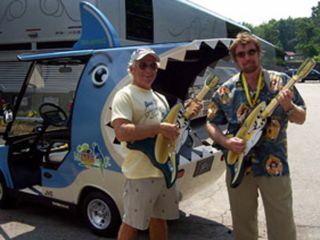 The SharKart features a 42-inch JVC HDTV, a PlayStation 3 videogame system, a custom-designed Peavey sound system with a microphone and a pair of Peavey SharKontroller real wood videogame controllers crafted in the motif of Buffett's LandShark Lager. And the vehicle itself is modeled to resemble - you guessed it - a shark that can swim on the land. Jimmy Buffett created new versions of Margaritaville, Volcano and Cheeseburger In Paradise for the SharKart. The songs are available online at Xbox and PlayStation sites.